At first glance, those words may not seem like much, but those who know me well will appreciate how profound they were for me. That quote served as a reminder to me that our past does not define us, and that we have the power to change the future by refusing to let history repeat itself. And so I set out on a mission to figure out how to be a better mother. I want to learn how to have more patience, and how to be less angry about the things I cannot change. I want to celebrate the good instead of focusing on the bad. And I want to be a positive role model for my daughter. It’s been a work in progress, but I’m slowly putting different strategies into place to help me learn how to be a better mother and I feel like I’m parenting with a lot more purpose as a result. If being a better mom is on your list of goals for this year, I hope these ideas help you as much as they’ve helped me! If your kids have a tendency to pull at your legs while simultaneously demanding snacks and sippy cup refills the moment you sit down, chances are they’re just vying for your attention. So instead of checking your Facebook feed, take some time to actually engage with them so they don’t feel the need to climb all over you in hopes you’ll notice them every time you need a few minutes to yourself. While I’m not really one to write my feelings down on paper for all the world to see, The Five-Minute Journal has been a life-changer for me. It’s a simple yet powerful tool you can use to train your brain to start and end each day with feelings of gratitude so you can learn how to be a happy and positive person rather than a miserable cow. LOL. And it only takes 5 minutes to complete! It helps set the tone for your day and encourages you to create change from within while also reminding you to count your blessings and resolve conflicts before the day is done. It’s one of the most powerful tools I’ve used to shift my focus and concentrate on the positives instead of the negatives, and I’ve gotten several of my friends hooked as well. Find out more about The Five-Minute Journal here. If you have a tendency to measure your success by the amount of things you accomplish each day/week, I urge you to rethink your strategy. While it’s great to knock a million things off your never-ending list of things to do, the key to productivity is to do fewer things for more effect instead. I know this sounds absolutely crazy, but once you train yourself to tackle a few big things each day instead of getting bogged down with a million little and unimportant things, you will feel more accomplished and in control, allowing you to be more focused and present when you are engaging with your kids. When frustration and anger strikes, ask yourself if you are you really mad at the person or situation that caused your emotions to erupt inside, or if something deeper is going on. Are you feeling overwhelmed? Stressed? Anxious? Tired? Do you suffer from low self-esteem? Did someone or something tap into feelings of deep-seated resentment you have from long ago? Are you plagued by feelings of jealousy? Anger and frustration often serve as masks, and it’s easier to resort to rage and annoyance than it is to face our true fears and insecurities, but if we take the time to figure out the REAL reason for our feelings and confront them head-on, we’ll be much better off in the long run. And so will our children! Have you ever caught yourself sitting on the couch after a long day, glass of white in hand, wondering when you last spent good, quality time with your child? Sure, you sang songs together on the drive to school, listened intently as she excitedly relayed the events of her day during the drive home, and maybe you even read her an extra bedtime story, but when was the last time you did something completely out of the ordinary with your child, just for fun, even though you had a million other things demanding your attention? Longer than you’d like to admit, right? The good news is that it’s REALLY easy to find ways to connect with your kids each day, and the impact can be pretty profound. When we ensure our children’s attention baskets are full throughout the day, we not only make them feel important, loved, and secure, but we also encourage better behavior as they are not desperately seeking our attention. This could be as simple as having an after school date at your local coffee shop every afternoon or picking out books to read together before bed each night. The point is to be very deliberate about this time so your child knows she will have your undivided attention every single day. While it’s human nature to put the needs of our children before our own, there is only so long we can live in a constant state of stress and fatigue before our bodies start to break down. We become anxious and irritable, depressed and withdrawn, and start to lose interest in the things that are happening around us. Life starts to feel like an uphill battle, and we eventually start taking our feelings out on the people we love. Do we realize this is happening? Perhaps. But since the ‘put your child before yourself’ concept is so ingrained in our brains, we become defeatists and remind ourselves that this is our lot in life. This is what we were meant to do. But what if I told you that’s a load of bologna? What if I told you it’s not only 100% okay to take time out for yourself, but that’s it’s essential for the well-being of your family? Here are 6 simple self-care tips I swear by, as well as some great activities I think you’ll love! From improved focus to weight management, the health benefits of adequate sleep are undeniable, and if you’re plagued with anger, irritability, depression, and general feelings of overwhelm, getting 8+ hours of shut eye is more important that ever. Struggle to find the time to sleep? Consider trading off with your spouse for night wake-ups and sleep-ins, schedule time for naps around your child’s schedule, or hire help so you can catch some extra Zs. Need help falling – and staying – asleep? Stick to a strict sleep routine, amp up your physical activity, limit caffeine and alcohol, and unplug after dinner. As annoying as it might sound, exercise really is the be all and end all of a healthy and happy existence. Not only does it reduce our risk of certain diseases and help us shed unwanted pounds, but it also contributes to a better mood and a healthier mental state. So next time you’re feeling irritable, angry, or devoid of patience, consider going for a run so you can sort through your emotions, get to the root of your feelings, and formulate an appropriate response. Instead of walking around with tense muscles and a permanent scowl on your face, stand up tall and SMILE, even if you don’t feel like it. You will be amazed at how differently people react to you when you’re not constantly on the defensive. Being unhappy all the time is really, really exhausting, and as difficult as it is to let go of negative feelings, it can be so incredibly freeing. Make a commitment to focus on the good and forget the bad and see where it takes you. You might just surprise yourself! Contrary to popular belief, learning how to be a better mother isn’t overly difficult. By practicing self-care, saying no to feelings of guilt, and finding ways to be more deliberate with our time – both with ourselves and with our children – we will not only foster a positive, happy environment for our families, but we will also model positive self-love for our children. 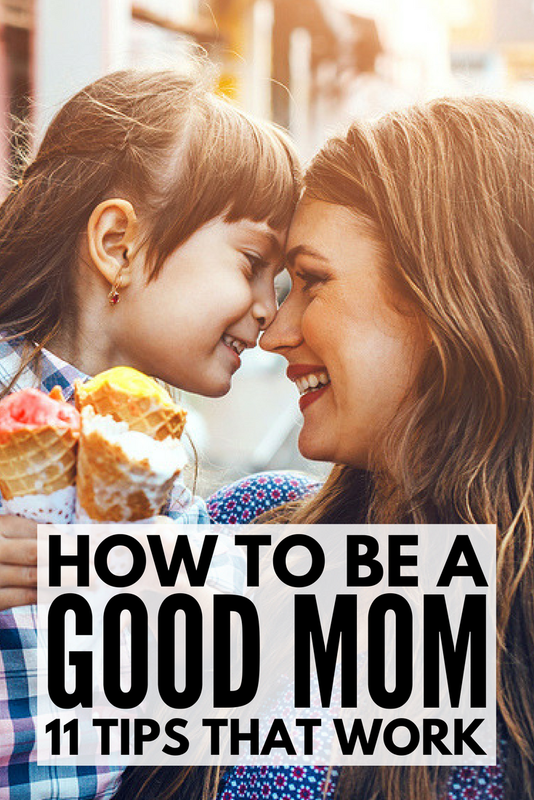 If you found these tips helpful in learning how to be a better mother, please share this post on Pinterest!